Review in a Nutshell: Kiss of the Royal was a solidly average read, with just enough unique plot devices to be fun and enjoyable, but lacking the world-development and depth to be memorable. Kiss of the Royal follows Princess Ivy, a descendant of the legendary Queen Marianna and one of the few pure Royals left. She is a member of the Legion, an army of Royals fighting against the Forces of Darkness. The Legion relies on the Royals partnering up and using the magic of their Kiss in order to defeat their enemies and cure curses. Ivy just lost her fifth partner in battle, and now there is only one other soldier, Prince Zach, who is as strong as she is. Unfortunately for her, he doesn’t believe in the magic of the Kiss and instead believes in the heretical concept of True Love. Ivy is convinced that her Kiss is the only way they will win this war, but Zach is adamant that he doesn’t need it. The world of Kiss of the Royal is interesting. It’s very high fantasy, with many different types of magical creatures and monsters. I really wish there was a little bit more information on the forces of darkness because I felt in the dark about them for the majority of the book. The lore is compelling, however not enough to make the info-dumps of legends and customs worthwhile. On another note, I know I say this with a lot of books, but with all the traveling all the characters do, I really felt it could have benefitted from a map, or really anything to make the setting feel more grounded. I wanted to know so much more about the world we were thrown in. The writing was good. It was fairly straightforward and to the point, but it made the action scenes entertaining and easy to visualize. However, at several points in this book, the word “kiss” will lose all meaning, I swear. It is said so much. I understand why – it would have been hard to avoid considering the concept – but it’s very very noticeable in the beginning. The pace was fairly quick, with plenty of action scenes to hold your interest, yet it did suffer from some info-dump moments that made me slam on the break and pulled me out of the book. Nevertheless, the plot kept me interested enough to read. It definitely made this book a lot more unique and fun. Onto the characters! Each character was fairly well developed and compelling. Ivy’s character arc was definitely interesting, while Zach’s was slightly underwhelming. However, I still thought he was a fun character. A lot of the side characters were kinda brushed away, not taking much focus. This book really does revolve around Ivy and Zach, and no one else (okay well maybe Bromley, Ivy’s page and brother figure, too). There was a little bit of insight into Queen Dahlia, Ivy’s mother, that I thought was interesting, but that was really it. 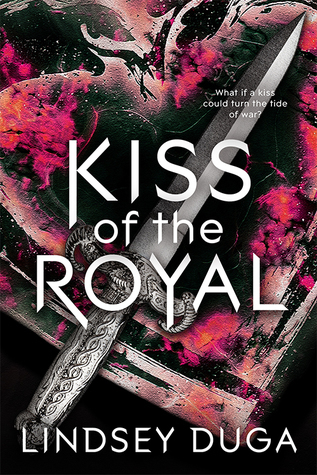 Kiss of the Royal is an okay read if you want some brainless action and fluffy romance, but if you are looking for anything deeper, this may not be a perfect read.